Interestingly, there isn’t a shade 4 in the new range for the UK (although there is online) I asked why this was. It is because when the new shades were developed internationally and then each market (the UK) could select the shades most suitable – shade 4 wasn’t seen as a good match for the UK’s skin tones but shade 7 was developed especially. Personally, I think the original shade is still the most suitable for me, but I love that they have brought out such a range of shades. Especially the darker skin tones that are often missed out in the UK market. It’s good to see a higher end brand take other ethnicities into consideration but I do wonder why they haven’t targeted many ethnic bloggers/publications with this new range. I bought #4 and #6 ages ago and would like to try no #7 to compare but I still think the product is grossly overrated. Are you sure you got shades 1.5 and 2 correct? Seems like they should be the other way round. 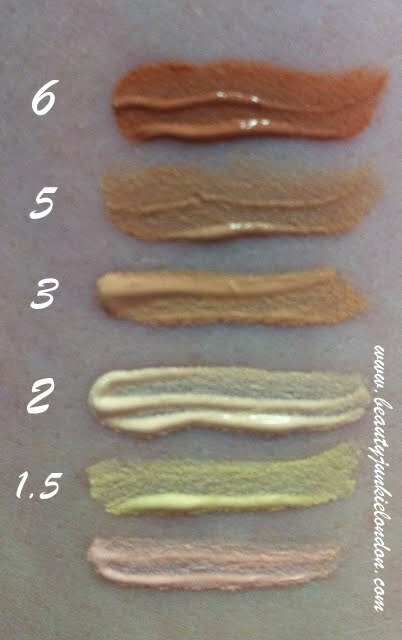 1.5 for fair complexions with golden undertones and 2 for fair complexions with pink undertones. Which was is the original one? I wonder if someone can tell me why they discontinued Shades 6 & 7? I’d maybe guess they were the lowest sellers? And with no warning! I’m annoyed too, really loved shade 7, I would have stocked up!